It’s Father’s Day Weekend! Be sure to check out our fun, Dad-approved events and activities here. Below you will find a whole weekend full of outdoor fun, dancing and adventure, as well as parties, laser shows and more! Happening this weekend in and around Boulder. 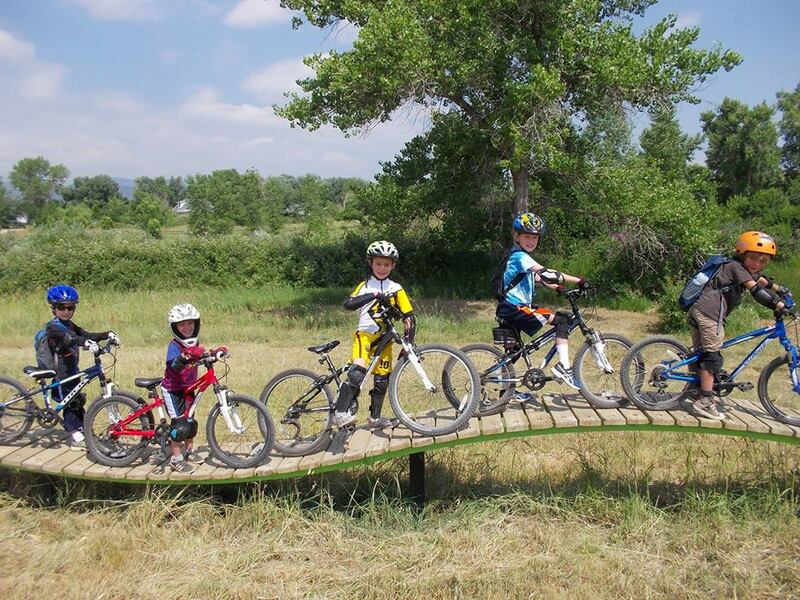 Valmont Bike Park is hosting Take a Kid Mountain Biking Day! Kids will have the chance to participate in pumptrack clinics, dual slalom clinics, try out demo bikes and take a tour of Valmont Bike Park. There will also be a rock climbing wall, face painting, and a free helmet giveaway from Boulder Community Hospital! More information and to register for clinics, go to valmontbikepark.com. Sponsored by Avid4Adventure, Lee Likes Bikes, 303 Dirt, Rockwell Ridewell, Full Cycle, Boulder Community Hospital, Bobo’s Oat Bars, Bicycle Village, Community Cycles & Honest Tea. Valmont Bike Park is located at 3160 Airport Rd, Boulder, CO 80301. The event will be held Saturday, June 16, 2018 from 9AM – 11AM. This event is FREE. Join the Boulder JCC Saturday morning to rest, renew, move through a gentle yoga sequence, and start your Shabbat morning right at Farmside Family Yoga. Play with the goats after your mindful practice. Geared toward families with children 3-8 years old, but all ages welcome. This program is made possible through a grant from PJ Library, a program of the Harold Grinspoon Foundation, and PJ Library Alliance partners. Boulder JCC is located at 6007 Oreg Ave, Boulder, CO 80303. Farmside Family Yoga will be held June 16, 2018 from 9:30AM – 10:30AM. $5/Child, tickets available here. Fiske Planetarium is hosting a kid-friendly Double Feature, pairing a family-friendly fulldome shows with its most popular laser shows. In the film “We Are Stars,” narrated by Andy Serkis, the characters seek to answer some of the biggest questions of all time. What are we made of? Where did it all come from? Explore the secrets of our cosmic chemistry, our explosive origins and connect life on Earth to the evolution of the Universe. A family-friendly film full of fun, adventure, and enlightenment. (30 minutes). Perseus and Andromeda, one of the most famous tales in Greek mythology. The story is told using our state of the art laser system with characters dazzling the dome. The laser show (30 minutes). Fiske Planetarium is located at 2414 Regent Dr, Boulder, CO 80309. The Double Feature will be held on June 16, 2018 from 1PM – 2PM. Tickets are $7 for kids, seniors & veterans/ $10 for adults, available for purchase here. The G’Knight Ride presented by Bicycle Longmont is a celebration of cycling, and is meant for cyclists of all ages, sizes, and abilities. The Ride is a great excuse to dust off that old 10-speed, mountain bike, or cruiser and hop on with 2,000+ other riders on a great evening tour. The G’Knight Ride helps to fun cycling education and bike refurbishing programs throughout the year by Bicycle Longmont, the area non-profit bike advocacy organization movie-themed trivia! The G’Knight Ride is held at Roosevelt Park, 775 Coffman St, Longmont, CO 80501 on Saturday, June 16, 2018 from 3PM – 10PM. Tickets: Kids 5 – 18 $10 (discounts available for multiple kids), Adults $32, VIP $75, Kids under 5 are FREE. Tickets here. Neptune Mountaineering is celebrating 45 years with a Grand Re-Opening Celebration Party. Upslope beer, Snarf’s Sandwich bites, Sweet Cow Ice Cream (free scoops for kids 10 and under while supplies last), Southern Sun Snacks, Lucky’s Grillables, fruit, and veggies, Tandoori Grill Appetizers, gear games, a huge prize drawing, and live music from Flash Mountain Flood. This celebration is for the entire community. Neptune Mountaineering is located at 633 S Broadway, Boulder, CO 80305. The party will be held on June 16, 2018 from 3PM – 8:30PM. The event is FREE. The Rock and Roll Playhouse presents a Father’s Day celebration: The Music of the Grateful Dead for Kids at the Boulder Theater. Created to provide a shared musical experience for parents and children, the Rock and Roll Playhouse hosts adult-friendly kids’ concerts. Local musicians play music live while kids and parents dance and play in the crowd. The Music of the Grateful Dead will be hosted at the Boulder Theater this Sunday, June 17, 2018 at 11:30AM and a second show at 2:30PM. Tickets are $15, available here. Are you ready do dance?! The Boulder International Festival brings together over 40 different dance groups with styles from all around the world. Learn about other cultures, buy hand crafted goods, and dance, Dance, DANCE! A public square dance kicks off the festival on Friday evening. Everyone can learn easy folk dances, waltz, salsa, Zumba, and more. Dance with live music on Sat. evening. During the day on Saturday and Sunday stroll through the vendor area and sample imported handmade items and arts and crafts. It’s all only steps away from some of the best dining and shopping in Boulder. City of Boulder parking garages are free on Saturday and Sunday. For the full schedule, click here. The Boulder International Festival will be held on the 1300 block of Pearl Street June 15 – 17, 2018. The event is FREE. Make no bones about it – The Dinosaur Show is sure to tickle your funny bone and stimulate your imagination. Mesner Puppet Theater reaches into the past using hand, rod, shadow and body puppets to bring this prehistoric tale to life. Join paleontologist Dr. Dino Sawyer in exploring scientific theories (as well as some improbable ones) that explain what was and what might have been in the Age of the Dinosaurs. The Dinosaur Show will be held on Saturday, June 16, 2018 from 3PM – 4PM at Meadows Branch of the Boulder Public Library and on Sunday, June 17, 2018 from 2-3PM at the Main Branch of the Boulder Public Library. The event is FREE.